Wheeler Trophy "Finest in the World"
This is a copy of the original letter from the Indianapolis Motor Speedway officially awarding the Wheeler-Schebler Trophy to Harry Hartz, whose entries led the Indianapolis 500 at the 400-mile mark for three consecutive years beginning in 1930. Commissioned in 1909 by Frank Wheeler and George Schebler, founders of the Wheeler-Schebler Carburetor Company, the sterling silver masterpiece was originally a traveling trophy for the biggest events at the Indianapolis Motor Speedway during 1909 and 1910. With the advent of the Indianapolis 500 in 1911, the trophy was briefly retired but reactivated in 1913 as a prize for leading the Greatest Spectacle in Racing at the 400 mile mark. 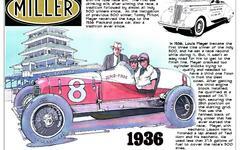 Frank Wheeler was also one of the four founders of the Indianapolis Motor Speedway.